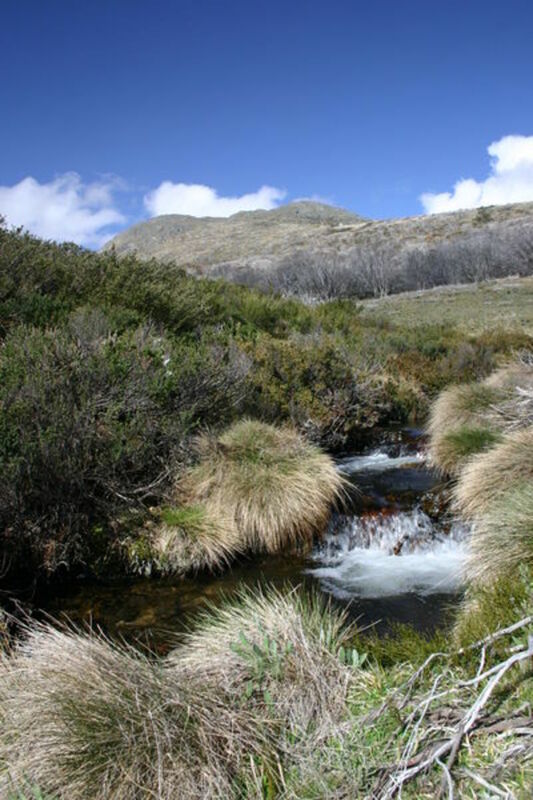 For a change in schedule, we planned an October walk into the Kosciuszko National Park. We wanted to get up there while there was still some snow, and finally conquer the heights of Mount Jagungal. Not only were we out of season, but we are also in large numbers! Five hikers in all, Graham, Eddy, Doug, Richard and Kim. 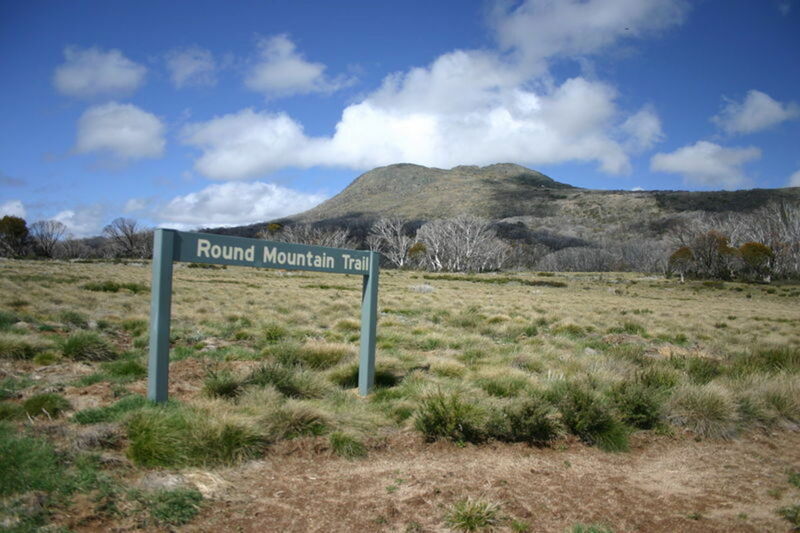 The plan was to head out of Round Mountain car park, and head straight for the Jagungal saddle via Farm Ridge fire trail. 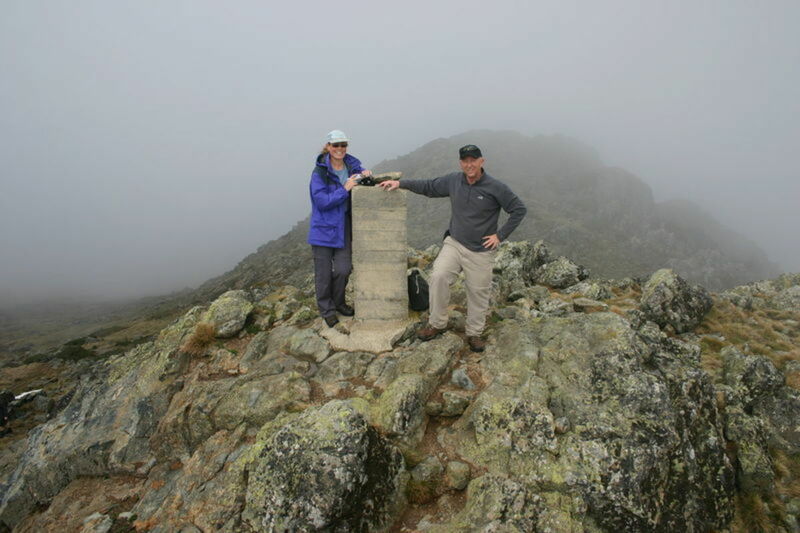 From there we would attach the peak, and then on subsequent days walk over the Bulls Peaks and back over to Strawberry hill. 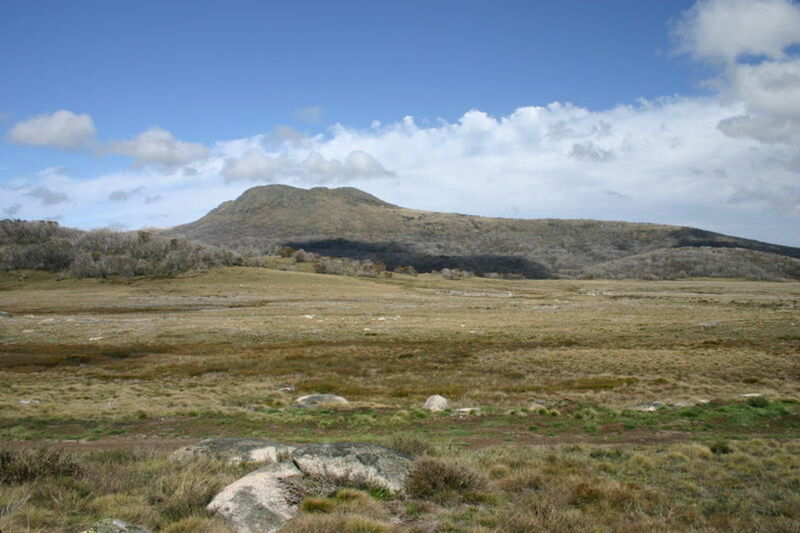 The final day would see us walk out on Grey Mare fire trail, and Round Mountain fire trail via Dershko’s hut. That was the plan anyway! 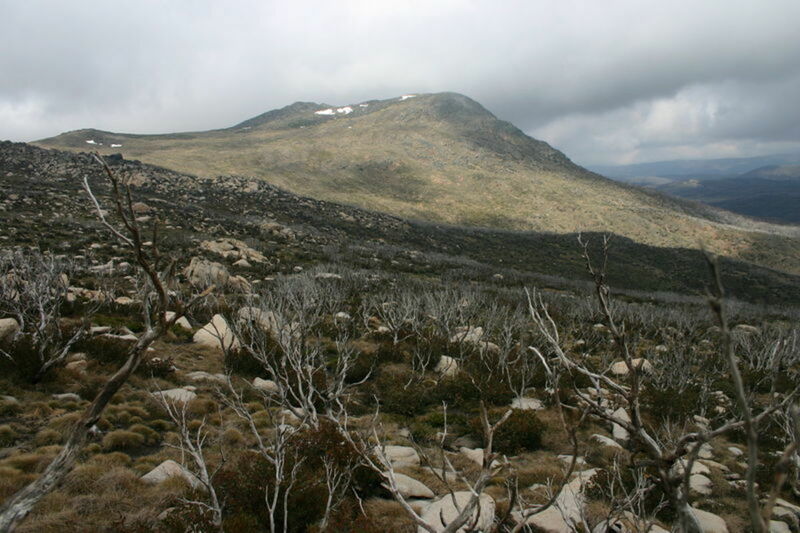 We left Wollongong at 4:00pm, and after collecting the hikers along the way, we arrived at Round Mountain car park at 11:00pm. There was a little rain falling, but we decided to hit the trail out to Round Mountain hut before pitching camp. A little champagne was had before we left the car park, so our spirits were high! The trail is pretty easy to navigate in the dark, plus there was a full moon so seeing was easy. We arrived at the hut around midnight and quietly made our way inside out of the rain. It was warm in here, which would usually indicate a group of people were inside. Not quite a group, we managed to scare the life out of one injured hiker that had been left behind by her group and was in deep sleep when woken by a bunch of wet walkers!! The morning started at 6:30am, but it took us a while to get away from camp around 8:30am. The weather was looking fine at this stage. 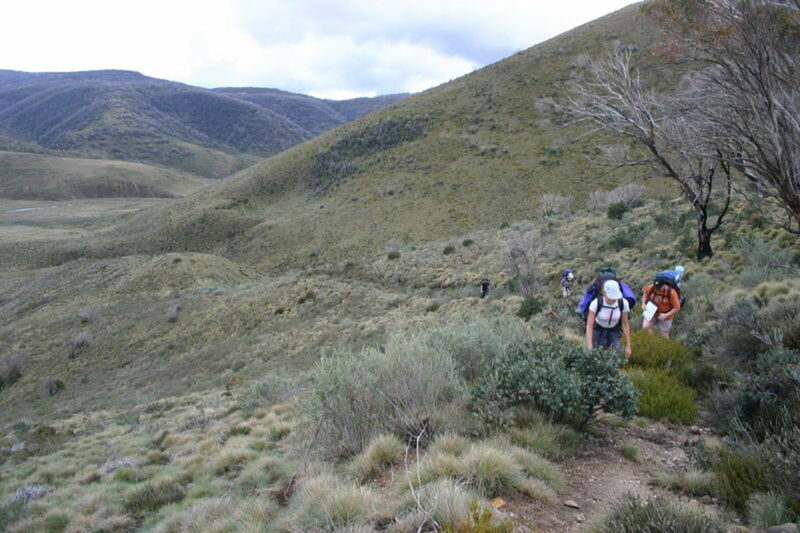 The trail is very clear, no problem finding the directions and at the bottom of the hill, the boots come off for the Tumut river crossing. 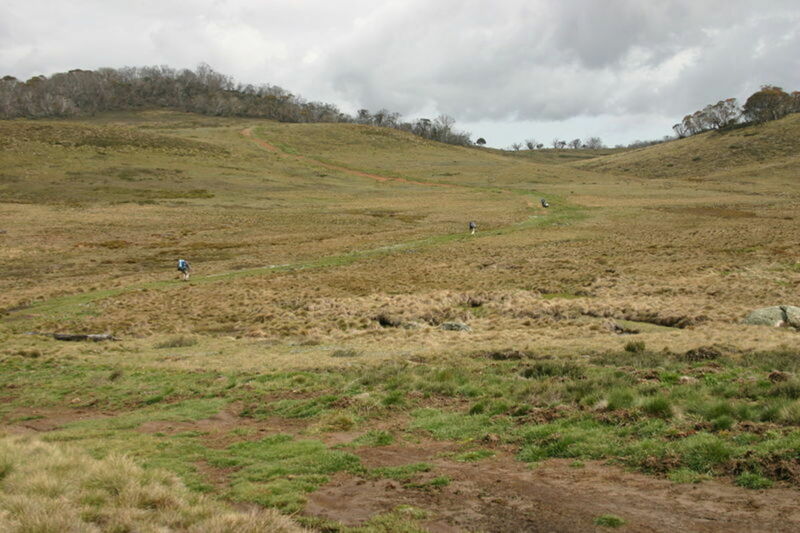 The hill out of the Tumut river valley is a steep one and goes on for much further than you think! There are some amazing views looking both ways along the valley, and many camp sites once you hit the top of the ridge line. 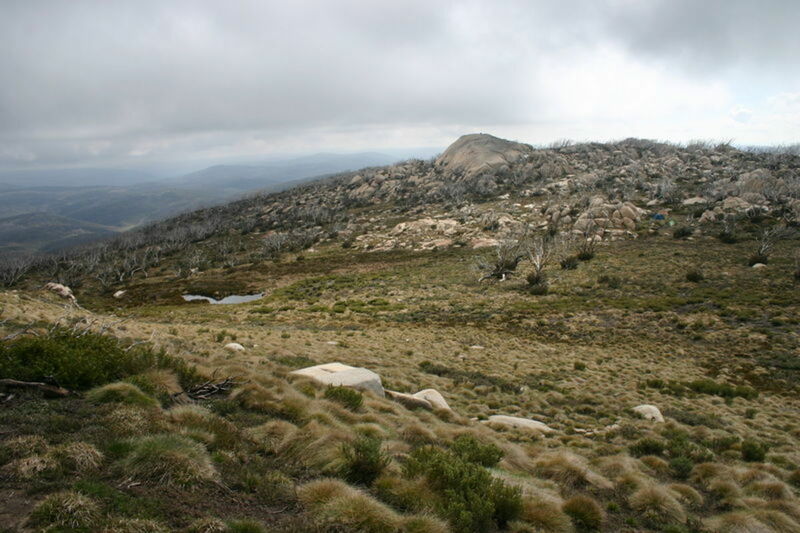 Once down the other side of the ridge, there is an old farm ruin that can be used as a good camp site for a large group if necessary. The weather was still ok at this stage, but the flies were pretty ordinary! But just when we thought the flies were bad, the ants attacked us! 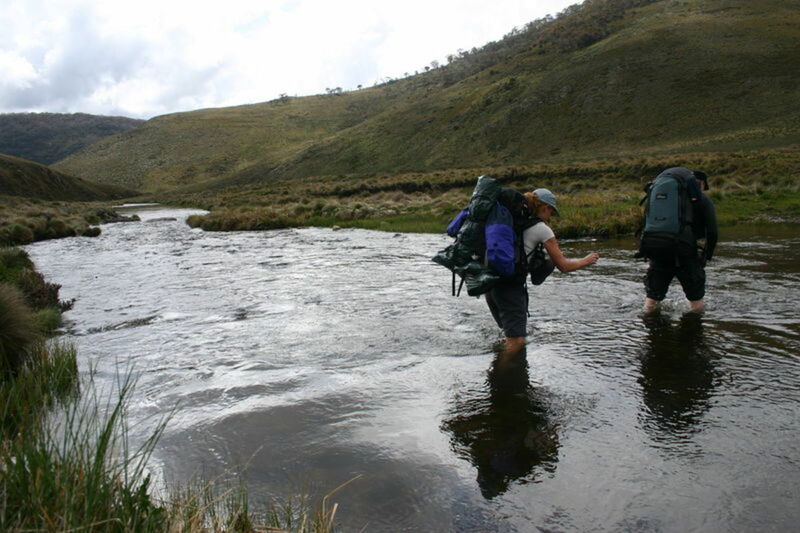 Crossing the Bogong creek we paused for a moment and were covered in ants! So we trudged up to the top of the hill and away from the attacks. Shortly after lunch, the weather changed. We watched a storm breaking across the valley first, then very soon it hit us. 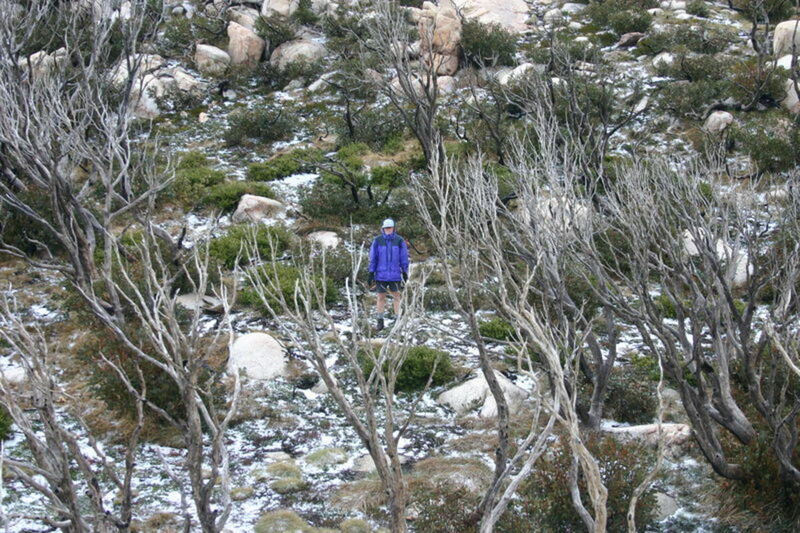 This was just after turning off the main trail and up the ridge for Jagungal. First it rained, but then the hail hit! 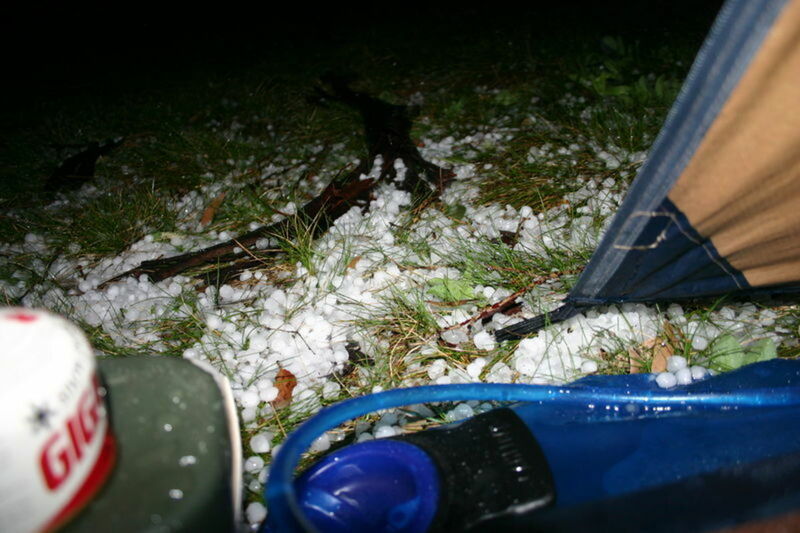 It was only small hail but uncomfortable. 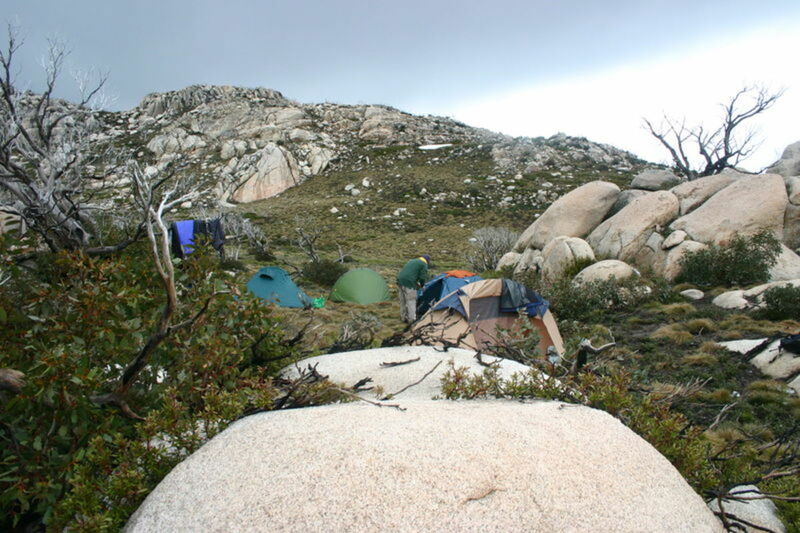 The rain only lasted an hour or so, and eventually found a good campsite sitting below the Jagungal peak. We managed to get a small fire going to warm and dry us out. But shortly after darkness fell, the rain started again, so it was off to bed for an early night. The morning was amazing, we were surrounded by mist first thing, but as the sun came up the mist burned off and we were provided with amazing views of the surrounding peaks and valleys. 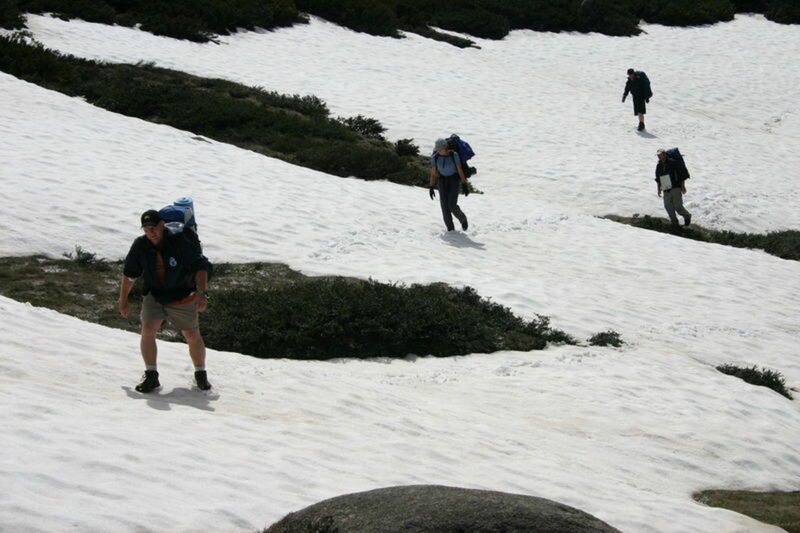 We set off to Jagungal with day packs at 9:00am. The walk was further than we expected, but some amazing views meant we sat around for a while checking things out. There were a lot of crows up there too which is a little eerie. We climb the peak to the East first, and not sure if this was actually the peak, we moved then to the Western peak. Then decided the peak was definitely the East!! There was still some snow around too, so we played around there, and took a bunch of photos. 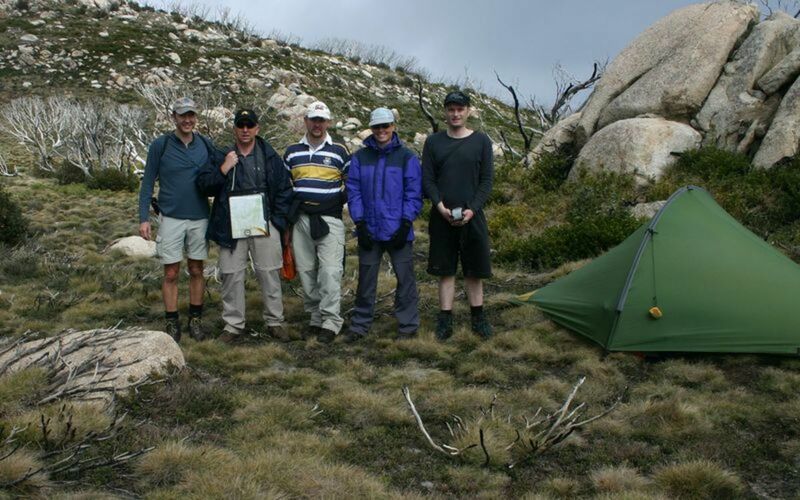 We returned to camp and completed packing up before heading out for the rest of the days walking. We left at around 1:00pm and the destination was going to be the Bulls Peak range. 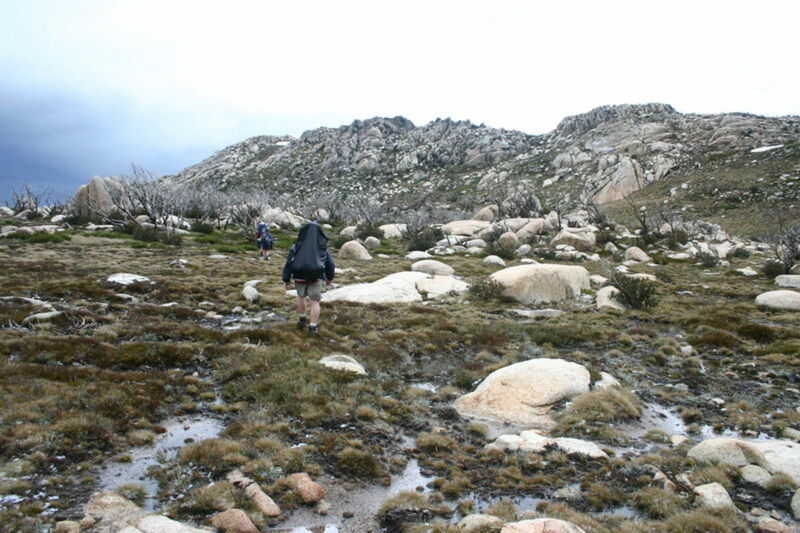 The walk was around to the East of Jagungal, and then along the Toolong range. 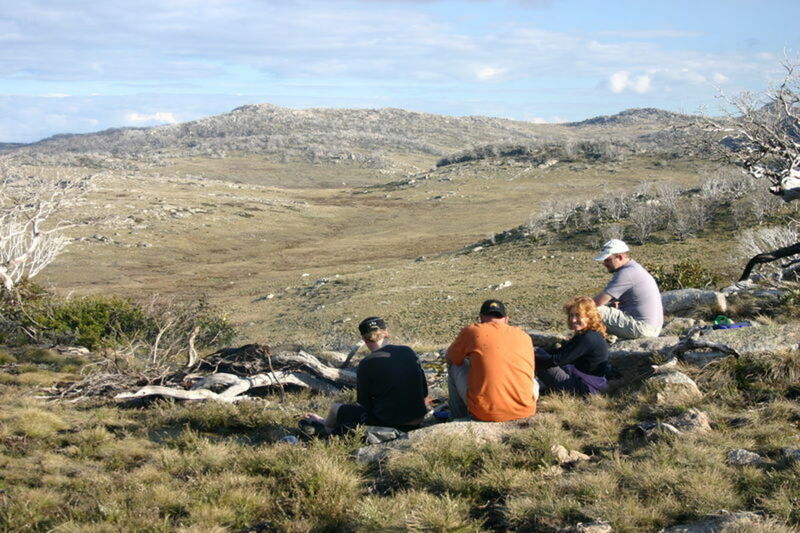 The views were amazing again, with views of Jagungal and the surrounding valleys. 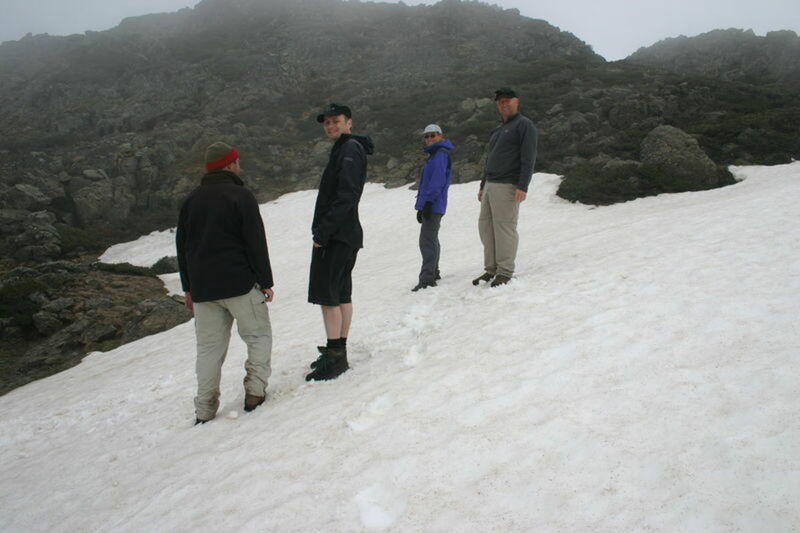 There was more snow on this side of the peaks, so once again we walked around in it! 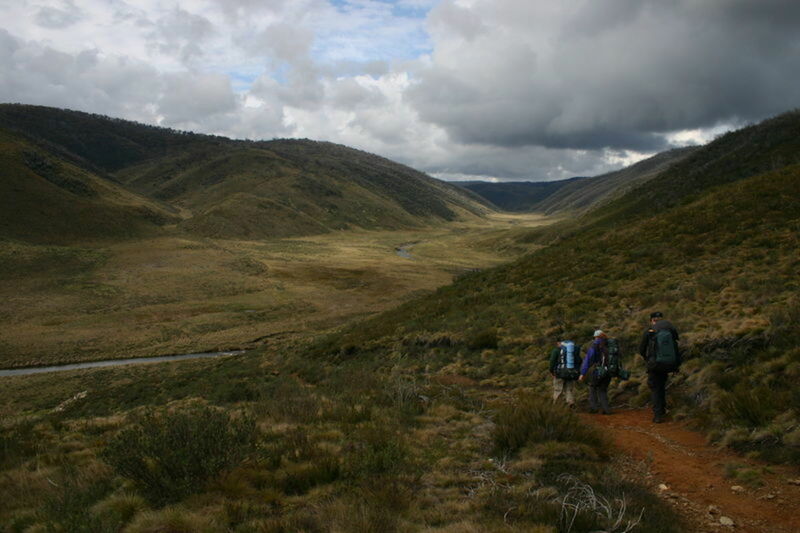 We eventually found a place to cross over the Geehi river, and found a camp site below the ridge on the Western side of the valley. It was still early, 3:45pm but we were worn out from the walk up the peaks and needed a good slow afternoon with a big fire, few drinks and a cigar! The night had been very windy, and the morning was cloudy. We broke camp at 9:30am, and we were now planning on heading out to Strawberry hill and then off to the fire trail. We were cutting out the Bulls Peak range. We headed west, which was directly into the wind! 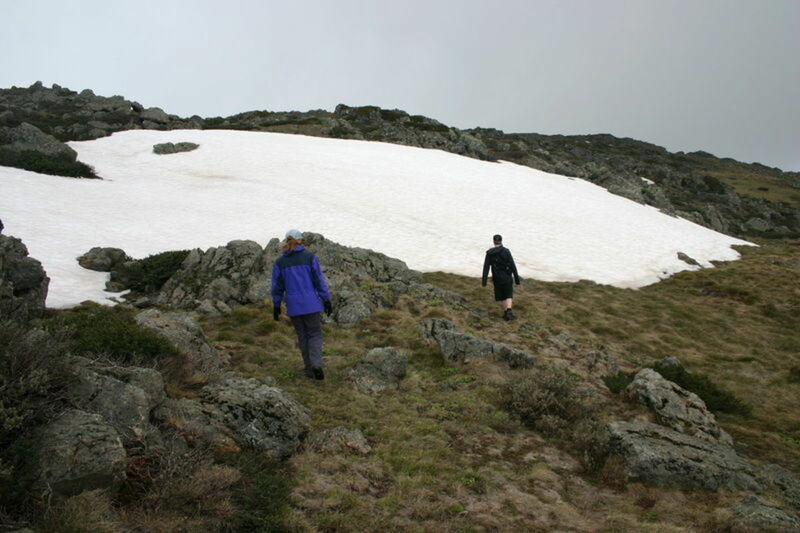 But we eventually found our way across the Strumbo range to the base of Strawberry hill. There was an amazing little camp site here which I am sure we will use in the future. But after a short break there, we headed for the peak of Strawberry hill. This was were the weather started to change again!! The wind increased, and the rain started. 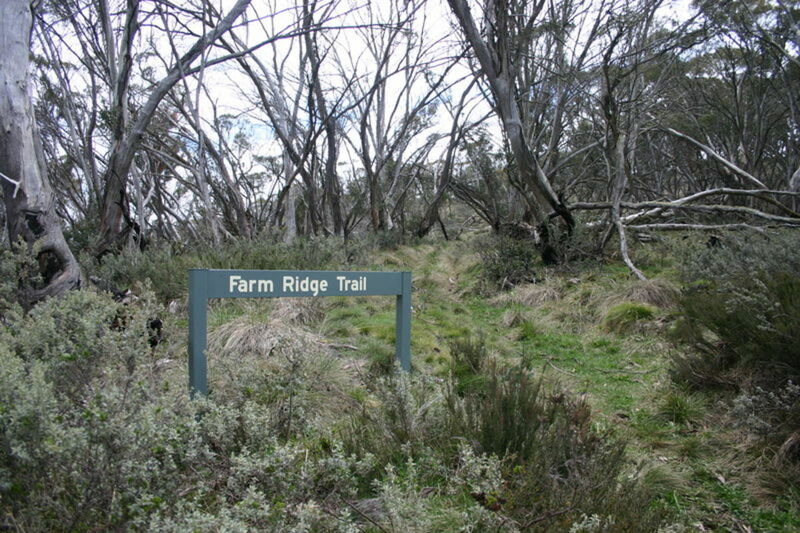 We headed towards Strumbo hill with the plan to find an old disused fire trail, Strawberry Hill fire trail. We eventually found the trail and followed it around Strumbo hill to the south until it hit Grey Mare fire trail. 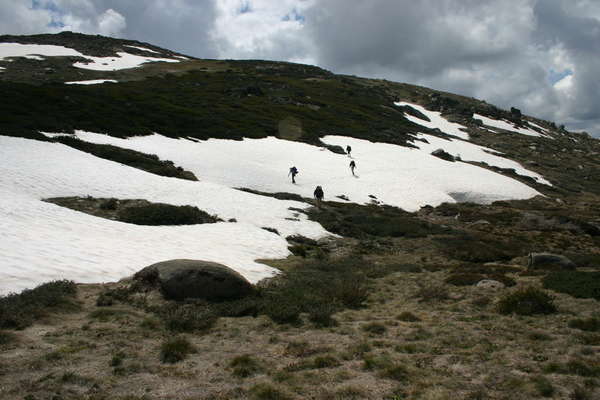 The weather was still pretty ordinary, so we continued on for as long as we could before stopping for lunch. That was Dershko’s Hut. The rain had stopped about 30 minutes before we arrived, but we were pretty wet by this stage. We did spot some wild Brumbies though which is not something you see every day! We dried out a little in the hut before setting up camp on top of the hill above the hut. 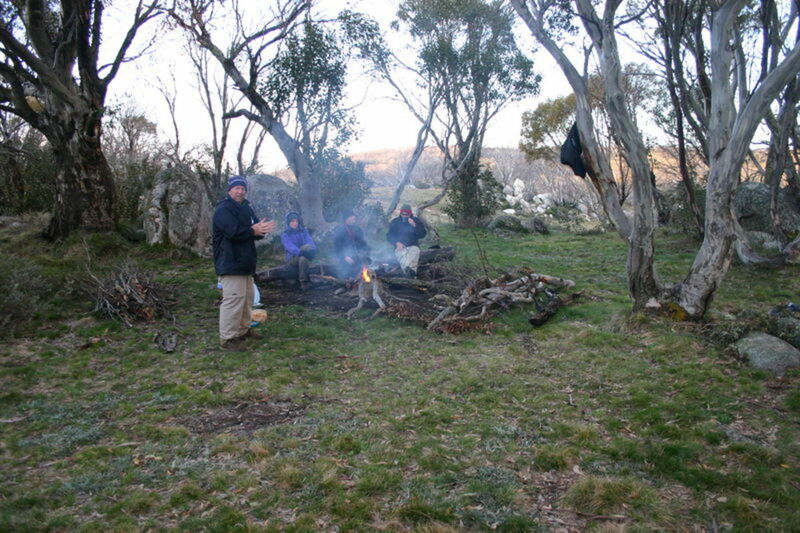 Then I took a short walk to the bottom of Jagungal to check out a few other camp sites, before returning back to the camp site to warm up next to the fire. After dinner, we watched a storm roll around the horizon, lots of lightning, but at this stage there was no rain here. After that night, I can highly recommend the DHM Hike Lite Cygnet tent! It was great, no water on the inside despite the weather and wind. It didn’t even shake around in the wind like most of the other tents. 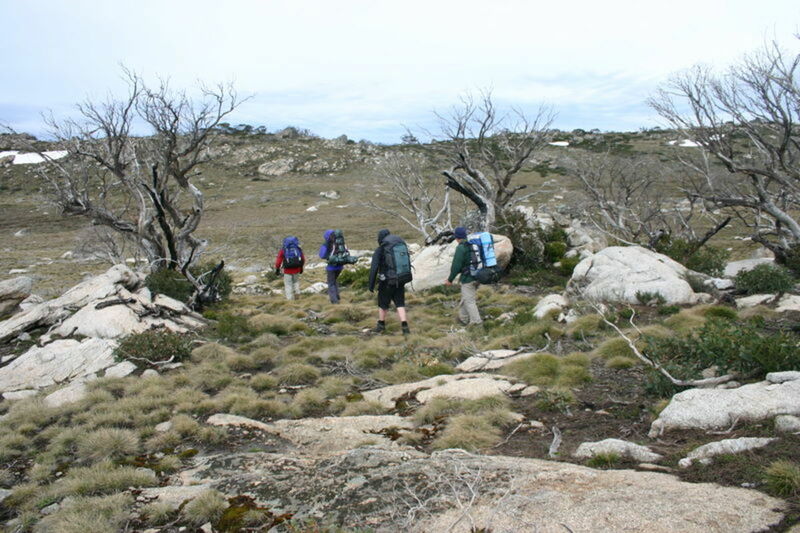 The morning was looking pretty good, so we head off to the North along Round Mountain fire trail towards the car park. The walk was going ok for a while, until the rain started again, but very soon, the rain turned to snow!! But it didn’t last too long so we kept on walking until we got to the bottom of the final hill at 12:30 where we rested a while before heading back up the hill to the car park. 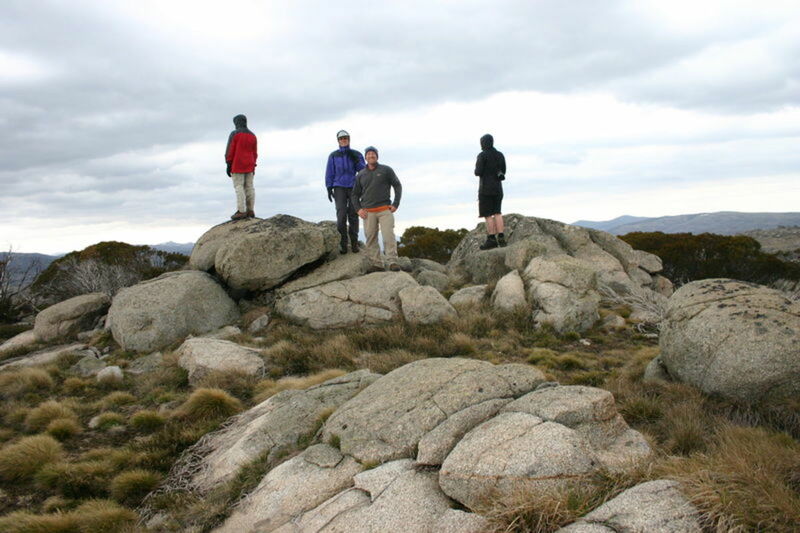 Overall a very good trip, which we finally managed to conquer Mount Jagungal!! 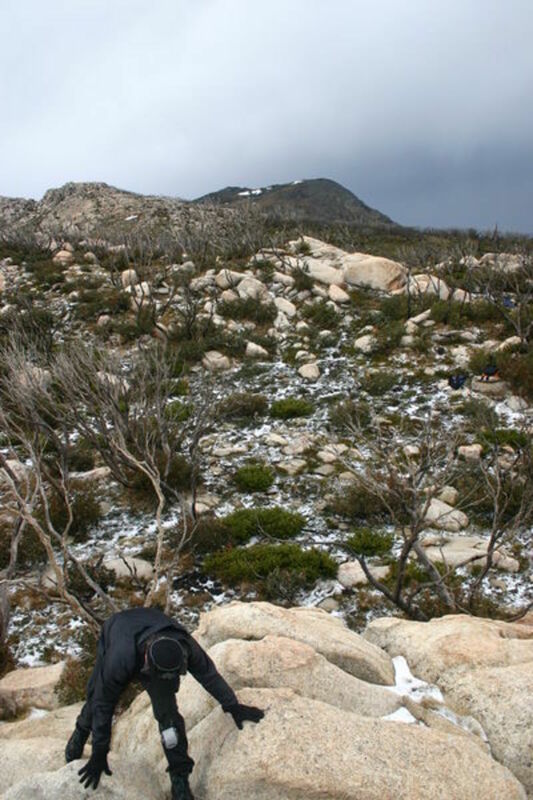 We also managed to experience pretty much every weather condition imaginable!